For any business to be successful, it must have three things: a robust overall strategy, exceptional leaders, and engaged employees. While having clients is critical to the sustainability of any business, client service starts with engaged employees. Better quality of work life balance, develops more engaged employees, which creates a chain effect resulting in higher growth and profitability. Creating this chain reaction between engaged employees and satisfied clients was at the heart of ByDesign Communication’s internal communication programme for BDO. At every step of the process, research informed our thinking and it was clear through the research that a closer alignment between clients and employees were needed. Our strategy focused on a top-down & inside-out approach and ByDesign Communications created a 5-pillar internal communications programme called CHAIN Reaction. Getting EXCO involved – ByDesign ensured that the full Executive Committee and Operations Committee were involved in the process from inception. Make it everyone’s business – The HR team were engaged to help embed Chain Reaction in the values of the company. Consistent communication to all employees – a series of #TopTips through simple mailers to all staff to provide simple and easy-to-implement ideas to deliver better client service, unlock creativity and simple ideas to interact with other colleagues. Let everyone’s voice be heard – We created LINK Sessions, hosted by the CEO across the country for all employees to have their voice heard. Change the Game – To unlock additional value in the business, an innovation team called the “Game Changer Forum” was created which comprised of colleagues across the BDO business units and regional offices, offering different insight. BDO Award – BDO awarded a monetary award to an employee who submitted ideas to improve the business. NPS Score: BDO South Africa’s NPS score improved significantly exceeding the programme target in the first year. 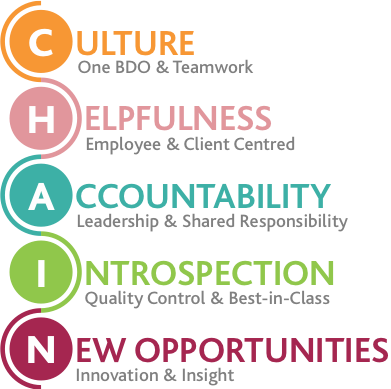 Measured as a KPI: Chain Reaction received the support of both the BDO executives, and employees. In 2018, the HR team will roll out a company-wide implementation of performance points aligned to Chain Reaction as part of all employees’ KPIs. LINK Sessions – The BDO CEO engaged with more than 180 employees in LINK Sessions. It was especially rewarding to see the changes in certain offices as the year progressed and elements of CHAIN Reaction started gaining traction. Game Changer Forum and BDO Award – 89 innovation ideas, were submitted in 2017, a significant increase of entries from previous years. The Game Changer Forum and the BDO Award were highlights for me personally. Getting staff from all areas of the business thinking about more than just their day jobs and only immediate surroundings, thinking more broadly about the business and where it is going, and how they can make a difference. ByDesign understands our business imperatives and have helped construct and implement a meaningful plan that is helping future proof of business. - Mark Steward, CEO of BDO South Africa.